don't get me wrong, I don't disagree with the idea that Layman should get playing time. if what the poster wanted to say is "we need to see more of Layman", he could have said it without adding all the stats. It's a simple statement and a fairy easy argument to make. Once he added the stats, conveniently editing out the per game box, he was comparing players, SF's in particular, and the difference in sample sizes becomes valid context. I left out per game box because it’s useless and I never use it to compare players. The only purpose of the stats was to show he at least deserves a further look. Didn’t know some needed it spelled out. dviss1 and PtldPlatypus like this. but you did spell it out and you used stats to do it. Pointing out significant sample size differences is valid context for any stat comparison...no? The fact that Jake may seem to be accepting being completely benched after being so much more efficient even with few/spotty minutes doesn't mean Stotts made the right move. Coach really didn't answer the question that well to me. bodyman5000 and 1 and BonesJones like this. Well of course he didn’t answer it well. He was feeling stupid. Think about it, Layman was doing really well starting, then he sits when Stotts man crush Harkless got back. Then right on cue after 5 games sitting Layman wastes no time to kill it. Blazers Roy, bodyman5000 and 1 and tester551 like this. Holdahl and Freeman mentioned on their podcast that Moe is considered a glue guy on the team, and that he needs to start because he said in the past that he needs that to be effective. Well I say, "then bring a consistant motor that actually helps the team win". The Blazers need Jake's offensive. Say all you want about defense, but drained shots win games. I see entirely too much empty play by Harkless in the starting lineup. It puts way too much pressure on the other 4. Jake was doing just fine in the starting lineup, and provided Dame with another quality finisher off his passes. My whole rub with Harkless is that he doesn't bring it every game. He has an inconsistent motor. If he can bring Dennis Rodman energy every game, then the Blazers would have a player, and winning would be a whole lot easier. TBpup, Rozay and bodyman5000 and 1 like this. Yeah. I am sure if Layman started... "to be effective" it might have a similar effect. But heaven forbid Harkless has to cold start from the bench. A tall, athletic player who moves well without the ball and has a nice shooting stroke. wHY sHouLD wE giVE ThiS gUy A chaNcE??? ripcityboy and TBpup like this. So true when you can have a low motor, shooting deficient, overrated defender instead. ripcityboy, Blazers Roy and Hoopguru like this. The Blazers lost 4 of the last 6 games Layman started. So not really sure you can say that is the issue, they were struggling before they made the switch. The biggest thing that has impacted the team, in my opinion, is that at the start of the year they started the games out feeding Nurk down low. Now they are playing more iso ball with the guards and Nurk out top and not as much with him at the rim. Y'all should check out the replies to this Nate Jones tweet about Layman. He's starting to get some notice. He needs to be shut down quick! We don't want that word getting out before playoffs! 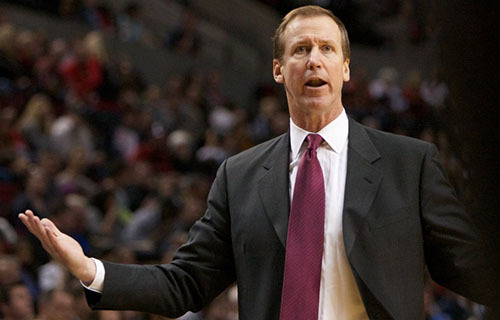 Time for Stotts to shut him down! Man he made so many plays last night that didn’t show up in the box score. But I think my favorite was on a fast break when he had a pretty good look at a three but passed it to CJ for an even better one. I also liked when he busted out the euro step. He’s got so much in his toolbox I love it. PtldPlatypus, rotary111, Pinwheel1 and 1 other person like this. Of course there's someone comparing him to Chandler Parsons, they're both white! I play a game where I compare white players of contrasting skill sets with people to see if I can get away with it. As long as you don't compare Scott Skiles to Shawn Bradley, used be amazed what people don't pick up on.